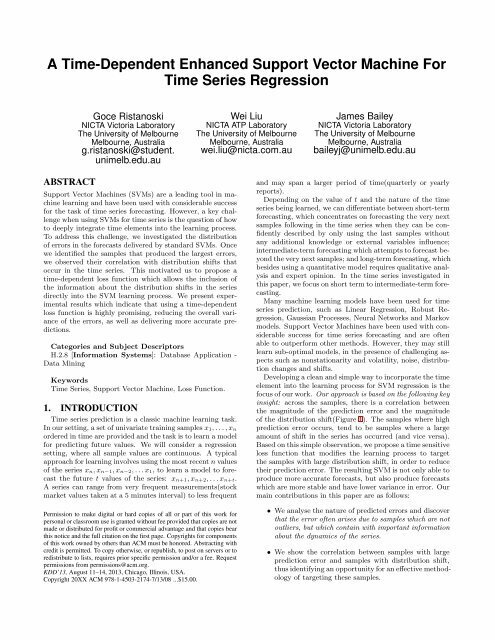 A Time-Dependent Enhanced Support Vector Machine For Time Series Regression Goce Ristanoski NICTA Victoria Laboratory The University of Melbourne Melbourne, Australia g.ristanoski@student. unimelb.edu.au Wei Liu NICTA ATP Laboratory The University of Melbourne Melbourne, Australia wei.liu@nicta.com.au James Bailey NICTA Victoria Laboratory The University of Melbourne Melbourne, Australia baileyj@unimelb.edu.au ABSTRACT Support Vector Machines (SVMs) are a leading tool in machine learning and have been used with considerable success for the task of time series forecasting. However, a key challenge when using SVMs for time series is the question of how to deeply integrate time elements into the learning process. To address this challenge, we investigated the distribution of errors in the forecasts delivered by standard SVMs. Once we identified the samples that produced the largest errors, we observed their correlation with distribution shifts that occur in the time series. This motivated us to propose a time-dependent loss function which allows the inclusion of the information about the distribution shifts in the series directly into the SVM learning process. We present experimental results which indicate that using a time-dependent loss function is highly promising, reducing the overall variance of the errors, as well as delivering more accurate predictions. Categories and Subject Descriptors H.2.8 [Information Systems]: Database Application - Data Mining Keywords Time Series, Support Vector Machine, Loss Function. 1.  INTRODUCTION Time series prediction is a classic machine learning task. In our setting, a set of univariate training samples x 1,...,x n ordered in time are providedand the task is to learn a model for predicting future values. We will consider a regression setting, where all sample values are continuous. A typical approach for learning involvesusingthemost recent n values of the series x n,x n−1,x n−2,...x 1, to learn a model to forecast the future t values of the series: x n+1,x n+2,...x n+t. A series can range from very frequent measurements(stock market values taken at a 5 minutes interval) to less frequent Permission to make digital or hard copies of all or part of this work for personal or classroom use is granted without fee provided that copies are not made or distributed for profit or commercial advantage and that copies bear this notice and the full citation on the first page. Copyrights for components of this work owned by others than ACM must be honored. Abstracting with credit is permitted. To copy otherwise, or republish, to post on servers or to redistribute to lists, requires prior specific permission and/or a fee. Request permissions from permissions@acm.org. KDD’13, August 11–14, 2013, Chicago, Illinois, USA. Copyright 20XX ACM 978-1-4503-2174-7/13/08 ...$15.00. and may span a larger period of time(quarterly or yearly reports). Depending on the value of t and the nature of the time series beinglearned, we can differentiate between short-term forecasting, which concentrates on forecasting the very next samples following in the time series when they can be confidently described by only using the last samples without any additional knowledge or external variables influence; intermediate-termforecastingwhichattemptstoforecast beyondtheverynextsamples; andlong-termforecasting, which besides using a quantitative model requires qualitative analysis and expert opinion. In the time series investigated in thispaper, we focus onshort termtointermediate-termforecasting. Many machine learning models have been used for time series prediction, such as Linear Regression, Robust Regression, Gaussian Processes, Neural Networks and Markov models. Support Vector Machines have been used with considerable success for time series forecasting and are often able to outperform other methods. However, they may still learn sub-optimal models, in the presence of challenging aspects such as nonstationarity and volatility, noise, distribution changes and shifts. Developingaclean andsimple way toincorporate thetime element into the learning process for SVM regression is the focusofourwork. Our approach is based on the following key insight: across the samples, there is a correlation between the magnitude of the prediction error and the magnitude of the distribution shift(Figure 1). The samples where high prediction error occurs, tend to be samples where a large amount of shift in the series has occurred (and vice versa). Basedonthissimpleobservation, weproposeatimesensitive loss function that modifies the learning process to target the samples with large distribution shift, in order to reduce their prediction error. The resulting SVM is not only able to produce more accurate forecasts, but also produce forecasts which are more stable and have lower variance in error. Our main contributions in this paper are as follows: • We analyse the nature of predicted errors and discover that the error often arises due to samples which are not outliers, but which contain with important information about the dynamics of the series. • We show the correlation between samples with large prediction error and samples with distribution shift, thusidentifyinganopportunityforaneffectivemethodology of targeting these samples.